Set in the near-future UK, Ronan plays Daisy, an American teenager sent to stay with relatives in the English countryside. Initially withdrawn and alienated, she begins to warm up to her charming surroundings, and strikes up a romance with the handsome Edmund (George MacKay). But on the fringes of their idyllic summer days are tense news reports of an escalating conflict in Europe. As the UK falls into a violent, chaotic military state, Daisy finds herself hiding and fighting to survive. I did not have high expectation of the film initially (and was contemplating to give it a miss) when I saw many websites giving the film a 6/10 rating (imdb and rotten tomatoes). But hey, the show was actually under rated! I love the beautiful countryside scenes (and their English accent :P). The setting of the cottage, the hills, it was like Harry Potter + Nanny McPhee all in one – magical. The war times were rather abstract, showing snippets of the war through the tension between families, people and the activities, instead of the typical war scenes. Daisy’s and Piper’s way home was like Hunger Games without all the weird animals. One particular disappointing scene was the death of one of the characters (Guess who?). I did not cry (big surprise for myself! ), as there was a lack of build up for that character and it was hard for me to connect and feel for the character when he was gone. Besides that particular point, it was a pretty good film. This led me to wonder why the film was not given a good rating online. Was it because of the poorly made poster? Or the title which had little relevance to the great content? I felt that this is a film worth watching, not for the action nor the romance, but for the determination one can have in times of difficulty, to hold on to a particular promise with such perseverance, enough to push her back home. Saoirse Ronan’s character, Daisy, shot two enemy combatants, out of which , one of them is played by her real life father and actor, Paul Ronan. The director, Kevin Macdonald, had originally intended the cast to be all unknown or amateur actors and was looking for an American girl, around 16 years of age to play Daisy, but cast Irish actress 19 year old Saoirse Ronan instead, after her audition, reading a scene which left them in tears. Kevin Macdonald chose to film the first half of the film with a hand held camera to give the paradise-like countryside home a sense of humanity, as though the camera was alive and breathing. The second half of the film was shot in a more steady and smoother style to make the war torn countryside more sharp and unforgiving, as though the camera was mechanical. Check out How I Live Now Official Website and Facebook Page! 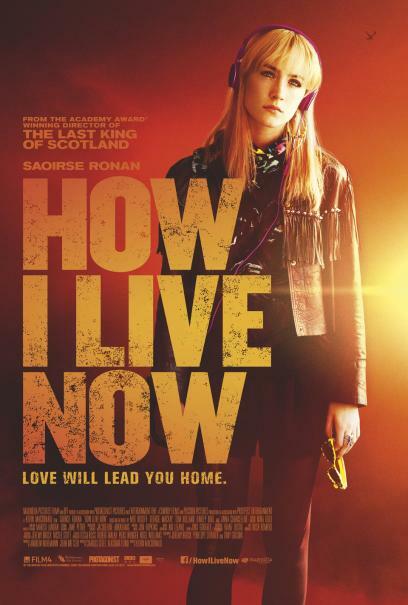 How I Live Now will be in cinemas on 23 January 2014. Tickets from Golden Village. No monetary compensation was received for the movie review.